On the 4th August 2011, Mark Duggan was shot and killed in Tottenham. His death led to widespread uprisings and riots! Those who were arrested and imprisoned were described as ‘feral youths’ but we now know, as the result of an exclusive article in the Mail on Sunday newspaper, that Mark had been set up by senior officers working within the MPS Operation Trident Unit. Join Mark’s family as we launch our demand for a public inquiry into the role of Operation Trident officers in putting guns out on the streets of London. Join the families of Mark Duggan, Cynthia Jarrett, Roger Sylvester, Joy Gardner and many other bereaved families as we formally launch NATIONAL INJUSTICE DAY. We have been quiet since the publication of the whitewashed IPCC report into the killing of Mark Duggan. We have been busy conducting our own investigations into their investigation. We are now ready to report back on a number of new revelations, some contained in David Rose’s explosive article revealing previously unpublished details on the role of the Mets Operation Trident in Mark’s death (please see link below) and the IPCC’s role in fanning the flames that led to the riots of 2011. Join us to hear Courtenay Griffiths, the UK’s leading black QC and judge, explain why there has to be a judge led public inquiry into the corrupt tactics of Operation Trident and it’s officers. Join us as we launch the Justice for Janice Campaign, Janice is yet another Tottenham resident who was attacked by a police officer, whilst caring for her severely disabled child in Great Ormond Street Hospital. The attack was so severe that the officer was charged yet acquitted at Crown Court even though two police officers testified against him (please see link below) Come and find out how this happened. Join us and learn about the launch of Operation Shield in Haringey! Operation Shield is the Mayors attempt to bring American style policing to London and they have decided to pilot it in Tottenham first. Come and find out what it is and why Tottenham. Under Attack We Fight Back! PLEASE SHARE ACROSS YOUR NETWORK! PLEASE SHARE ACROSS YOUR NETWORK! A message from the Duggan family to the Brown family & people of ferguson. Today the Justice for Mark Duggan Campaign held a press conference to respond to the judgement delivered at the Judicial Review, which upheld the ‘lawful’ killing verdict. In attendance were Carole and Marlon Duggan, Stafford Scott and Jude Lanchin, lawyer for Pamela Duggan, who read a statement on her behalf. 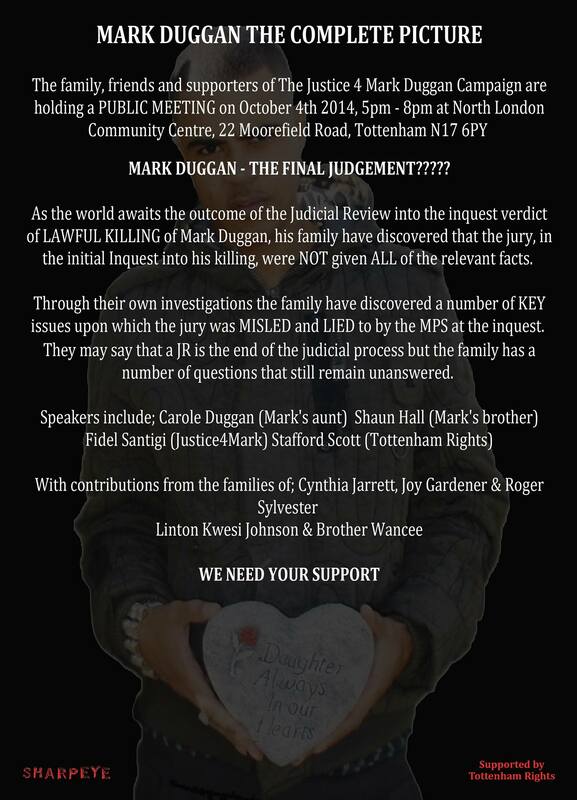 The Justice 4 Mark Duggan campaign would like to make an appeal to our friends and supporters for funds. Donations can be made on-line here http://justice4mark.com – donate button on the right, or by sending a cheque payable to “Justice for Mark Duggan” and post to J4M, BM Box 4390, London, WC1N 3XX. 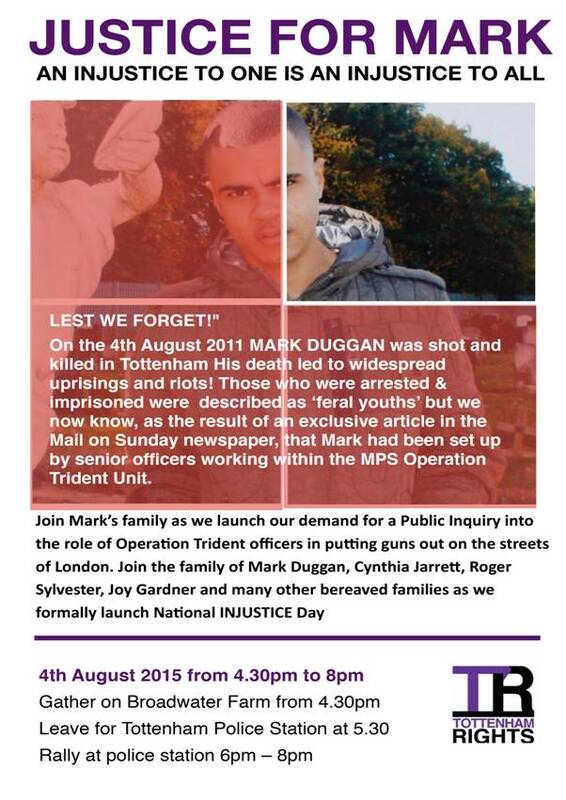 Next Monday 15th September Mark Duggan would have been 33 and celebrating with his family and friends. Instead Mark’s children, family and friends will be marking Mark’s life without him. Five weeks ago several hundred people marched from Broadwater Farm to Ferry Lane for a vigil to mark the 3rd anniversary of Marks death. The family launched a fresh witness appeal (https://justice4mark.com/2014/08/04/justice-for-mark-duggan-an-appeal-for-witnesses/) and announced plans to establish a foundation to fund projects in support of local young people. Many other justice campaigns and family members including Janet Alder, Marcia Rigg, Kadisha Burrell Brown, Myrna Simpson came out in support in addition to members of the community including Winston Silcott. Susan Alexander, whose son Azelle Rodney was shot dead by police, sent a message of support. People pledged the news that a Met officer is to be prosecuted for the death of Azelle Rodney should be just the beginning of achieving accountability for so many others who have died in custody. The Justice 4 Mark Duggan campaign would like to take this opportunity to thank all those who attended the march and vigil and who have supported us so far. However we still have a long road to travel. In the next few weeks we expect to hear the outcome of the judicial review into the Inquest conclusion which we hope will quash the “lawful killing” verdict . 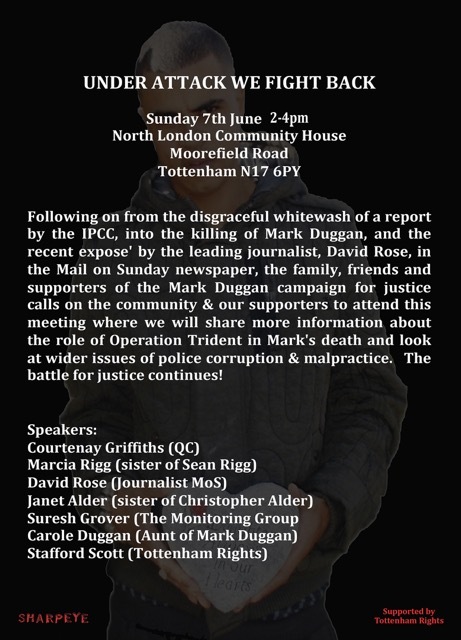 (see:http://www.inquest.org.uk/media/pr/mark-duggan-judicial-review-hearing-to-take-place-9-and-10-july ). In the meantime we will continue to spread the word about the witness appeal in the hope of shedding more light on the circumstances of Mark’s death. We will also be beginning the process of establishing a foundation in Mark’s name to initiate projects. These activities require funds. Not all family members live in London, for example, so funds need to be raised for every visit or meeting that takes place. Please support us by making a donation no matter how big or small.